The heart is derived from the splanchnic lateral mesoderm and initially forms as two crescent-shaped endocardial plates inside the evolving pericardial cavity. As the embryo undergoes lateral and cranial folding, the two plates come closer to each other and eventually fuse at the midline, forming a primordial cardiac tube. The linear cardiac tube is composed of an inner endocardial layer and an outer myocardial sheath, which are separated by an acellular, gelatinous matrix called the cardiac jelly. At this stage, the tube can undergo asynchronous, peristaltic contractions and the cardiac progenitor cells will evolve into primitive heart chambers, including the atria, atrioventricular canal and the left ventricle. 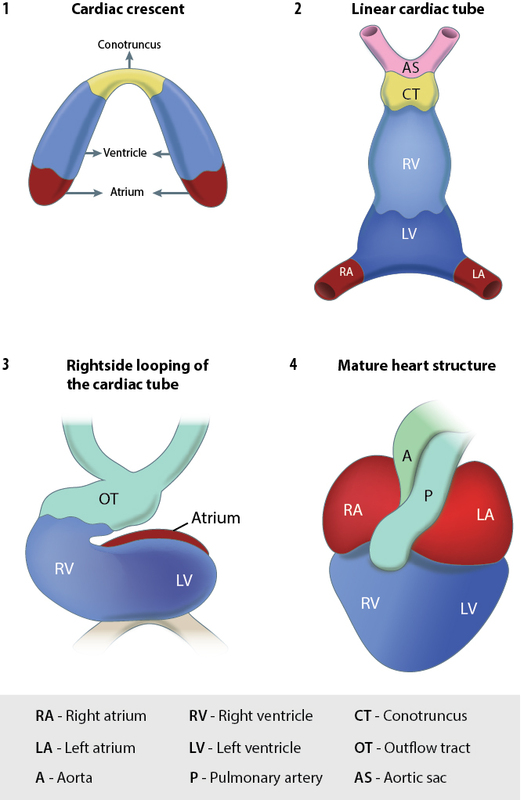 As the embryo grows, the cardiac progenitor cells proliferate and elongate rapidly at both ends of the tube and further contribute to the developing heart chambers, eventually forming the right ventricle, the developing atria, the atrial and the ventricular septae and the outflow tract. The developing heart undergoes various phases of looping, where it bends upon itself and assumes an S-shape. Looping facilitates the propulsion of blood through the cardiac chambers and coordinated contractions or pumping start to occur. The septae emerging within the atrium and the ventricle continue to grow, partitioning the heart into four chambers, specifically the atria (right and left) and ventricles (right and left). Within the atrioventricular canal and the outflow tract, thickened tissue sections are formed by epithelial-mesenchymal transition of some endothelial cells and their migration into the cardiac jelly. These structures, called the endocardial cushions, function as primitive valves and subsequently undergo extensive remodeling to develop into mature tricuspid, mitral, aortic and pulmonary valves in the heart. With the completion of septation and valve formation, the heart evolves into a fully functional, four-chambered pump by the end of eight weeks post-fertilization .